The isles of East and West Burra lie side by side on the west of the southern part of the mainland of Shetland. 6'10'' high, 1'7.5'' wide at the top to 1'5.5'' wide at the bottom, and thickness varies from 1.5'' to 2.5''. 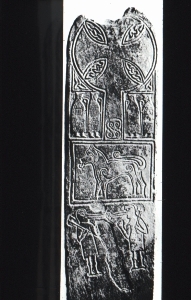 Upright rectangular slab. At the top of the shaft is a cross with four equal arms enclosed within a circle. Below this, on either side of the shaft, there are two ecclesiastics, both pairs facing the centre. All four have pointed hoods and croziers; one on each side carries a book satchel. Below this there is a rectangular panel enclosing a beast with its tail curled over its back. On the bottom of the slab there are two creatures with human bodies, arms, and heads, but with the legs and beaks of birds. They are both holding axes over their shoulders and pecking a human head in the middle.